The premise of this series, as introduced in the first issue, is that there is a big snowstorm headed to New York and in the midst of it all Peter Parker has to fight against mother nature and struggle against his responsibilities as a hero as well. This issue is more of the same, but with lots more touching moment throughout. Peter’s Uncle Ben famously said, just before his death, that with great power comes great responsibility. And that’s what we see here. Knowing that Aunt May is alone at him, Peter sets out to make sure that she is comfortable and taken care of during the storm. But on the way he has to help people who are, in one way or another, already caught in the storm’s grip and he has to make that decision call every single time, whether his responsibilities are more important or the safety of Aunt May. I like this issue. Not as much as the first one, sure, but I definitely liked it. This comic has a lot of heart and in today’s comic environment, something like that is quite valuable. Morrell deals with all the problems that Peter has to face in a really nice, really heroic kind of way and he shows off the character a lot. The point perhaps is that Spider-Man is a superhero for everybody. The working man’s superhero, so to speak. At least, that’s what I take away from all of this. 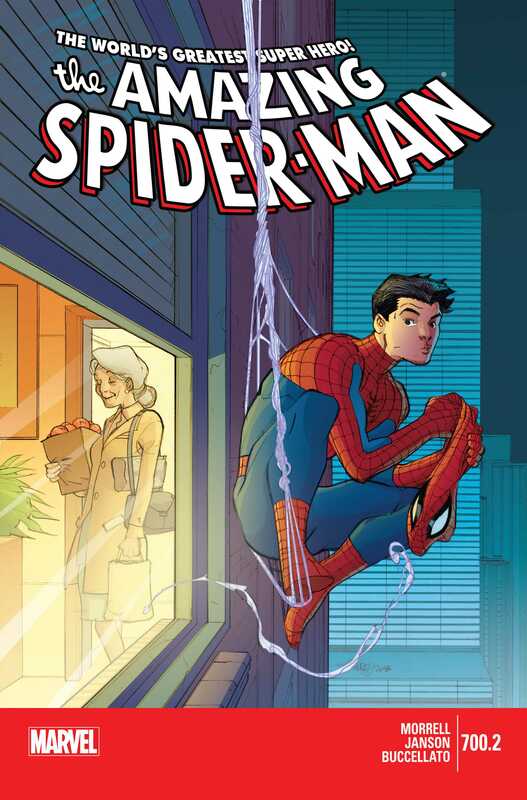 There are a lot of cameos in this issue, whether involving Uncle Ben or some of Spider-Man’s more notorious villains. The panels with Uncle Ben were among my favourites for this issue, and I’m really glad that I finally got the time to read this story. Bringing back dead characters like this, as mediums of knowledge and wisdom and what not in a very metaphysical kind of way is not easy by any times. I can recall a few that fell entirely flat for me. But things are different here with Morrell, and he really makes Uncle Ben shine as a character. He is a supporting cast member at best in the issue, if we take things a bit objectively. But subjectively Uncle Ben is the most important character in the entire issue. Perhaps even more than Spider-Man. Its Uncle Ben’s teaching and what not that gave Peter Parker the impetus to be a hero and the character performs a very similar role here as well. The final few pages of the issue, involving Peter helping Aunt May with chores around the house and really taking care of her, were some more great scenes. They are marred only by the fact that nothing significant actually happens. This could very well be a day in the life of kinda story, one which offers nothing substantial to the reader to latch on to. That’s really it. Like I said, Janson and Buccellato’s artwork throughout the issue is really good. Lots of little nods and tweaks throughout the issue, which help sell the entire atmosphere that Morrell is trying to establish in the script and in that way, Janson and Buccellato perform their jobs quite admirably. The pencils are clean and precise, with the colours being quite evocative. Overall, great issue, and I’ll definitely be reading #700.3 soon. More The Amazing Spider-Man: #648-651, #700.1. Posted on December 29, 2013, in Comics Reviews, Review Central and tagged Comics, Comics Review, David Morrell, Klaus Janson, Marvel, Marvel Comics, Morry Hollowell, Mutants, Pasqual Ferry, Peter Parker, Review, Review Central, Spider-Man, Steve Buccellatto, Superheroes, The Amazing Spider-Man, VC's Joe Caramagna, VC's Joe Sabino. Bookmark the permalink. 5 Comments.